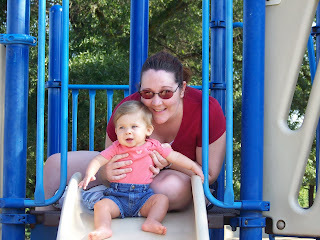 Yesterday Emma turned 10 months old & we celebrated by taking her to the park for the first. Unfortunately she is still too small for the baby swings but I got in one of the regular swings so she could at least have a chance to play. 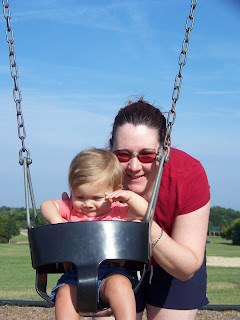 She seemed to really like it & jumped up & down on my lap when the swing would stop. It was as if she was trying to make it swing again. 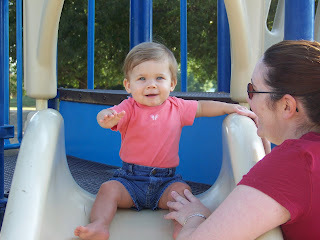 We took her to the slide & held her while she went down & she seemed to like it too. 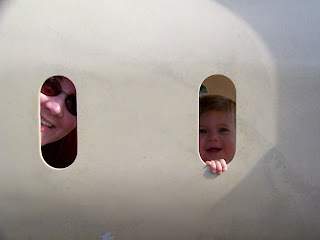 One of her favorite parts was this tunnel she could look through the window holes on the side & peek at us. 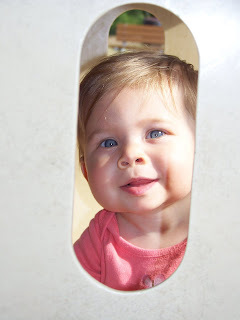 Emma is getting really close to crawling & is babbling a lot these days. She is finally getting the hang of self feeding but isn't crazy about table food just yet. She is also doing much better with her sippy cup. She had her second session with the physical therapist today (although she cried most of the time) & Leslie could already tell an improvement from last week. 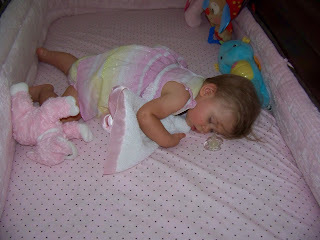 She seems to think Emma will be crawling within the next week or two but I am not quite sure. 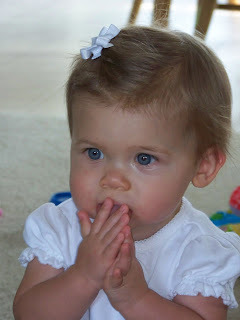 Dr. K (pediatrician) wanted Emma tested to see if she needed therapy & the therapist says she is only slightly behind. 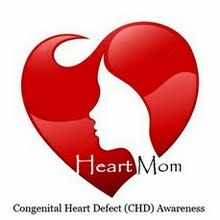 Emma will be going to therapy once a week until her heart surgery in Oct & she will start going back to therapy soon after the surgery. 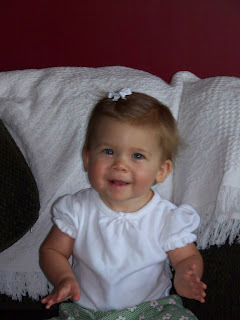 I started putting bows in her hair over the weekend, doesn't make her look so much older. Sweet serious look with those big blue eyes. Emma napping Sunday afternoon & cuddling with her bear blanket, she was too cute I had to take a picture. I think she is watching Spencer or some other children off in the distance. 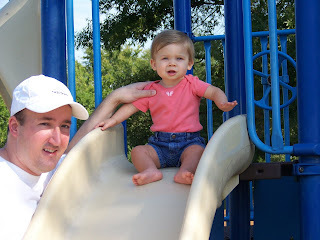 Here she is waving at her Daddy right before I help her go down the slide. See how tiny she looks in the baby swing. It almost came up to her chin. You could have fit 2 or 3 of her in that swing. What a precious family!!! 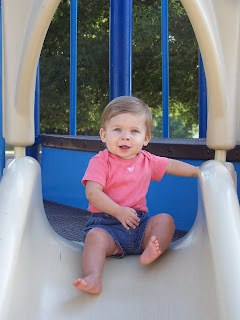 Emma just gets cuter each month! Hope all will go well with her surgery and she will just 'pick up speed' and be doing all kinds of new things!!! She is a doll!!! She just gets cuter every day!